There’s no place like home. These spots of outstanding natural beauty are so breath-taking you won’t believe that they’re in Britain. All the inspiration you'll need to explore the beauty of our own backyard. Wistman's Wood is one of the highest altitude woods in all of Britain. The oldest oak trees in the wood are estimated to be around 500 years old but the wood itself has been in place for thousands of years. The spot of outstanding beauty has been mentioned in writing for years, and it's not hard to see why. One legend claims that the wood was first planted by Isabel de Forz, the 8th Countess of Devon during the 13th century. During her lifetime de Forz was one the richest women in Britain, having inherited the earldom from her husband and her brother before she reached 30 years old. 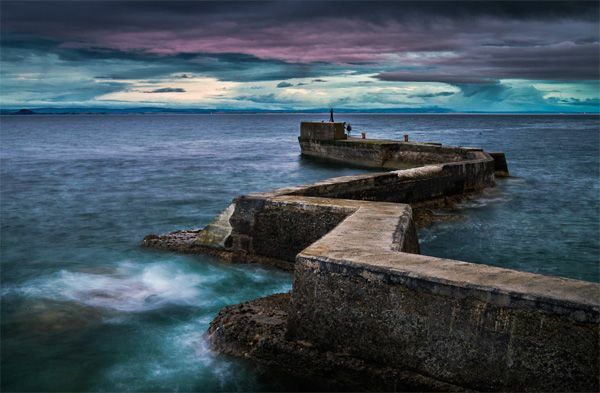 St Monans in Fife, Scotland, is a small fishing village located around 12 miles south of St Andrews. Thanks to its prime location along the Fife Coastal Path, the village is very popular with walkers and there's plenty on show to charm its visitors. Quaint 17th and 18th-century pantiled houses line the harbourside. A beautiful church built in the 14th century by David II in gratitude for surviving a shipwreck on the nearby coast is another picturesque pit stop. Stac Pollaidh might look like a setting straight out of The Martian, but it's actually a mountain in the Northwest Highlands of Scotland. Standing at a relatively low height of just 2000ft, it's a popular climbing peak and is easily accessible from the nearby road. A relatively fit climber could expect to scale the summit in just three hours. Located in Snowdonia, Llyn Padarn is a glacially formed lake which, at two miles long, is one of the largest lakes in all of Wales. The scenic view attracts many visitors with its safe swimming waters and friendly view towards kayaking, rowing and sailing. It looks like a scene straight out of Game of Thrones, and this medieval fortress has provided the inspiration for the backdrop of countless films and novels, including Disney's Brave. 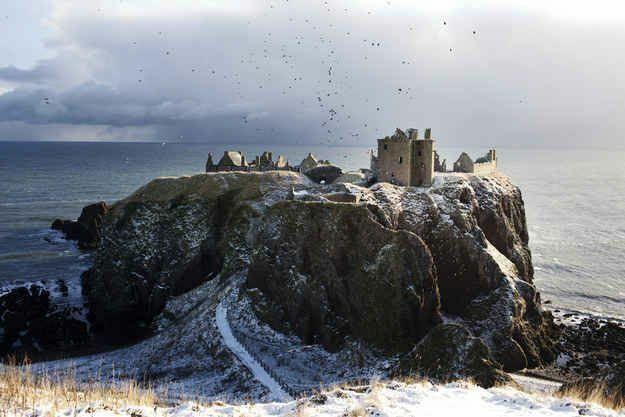 Dating from the 15th and 16th centuries, the castle has played a significant role in the history of Scotland. It's where the Scottish crown jewels were hidden when Oliver Cromwell's army invaded in the 17th century, for example. Following a restoration in the 20th century, the once imposing fortress is now open to the public. Where will the 241 Hotel Card take you this summer? Tucked away in County Antrim, Northern Ireland, this famous rope bridge connects the mainland to the tiny island of Carrickarede. Now owned and maintained by the National Trust, it's thought that salmon fishermen were building such rope bridges to the island for over 350 years. The bridge brings a large volume of visitors to the island, who can cross the bridge for a fee. In 2009 it saw some 247,000 visitors tread its slats. The journey is worth it if only to experience the night sky in Carrick-a-Rede, the north coast's only Dark Sky site. This breath-taking mountain range is not an easy set to climb and is steeped in mountaineering history. Famous pioneers including Bonnie Prince Charlie once walked in its shadow in order to gain access to the mainland and clamber aboard boats to France. If you're an experienced hiker, the challenge pays off as the mountain affords those lucky enough to reach its peaks sweeping views over the island. This pyramid-shaped mountain is one of Scotland's most recognisable landmarks due to its distinctive form. Its dramatic sloping shape is so striking that it has featured as a backdrop in several films, including the James Bond flick Skyfall. Cornwall's St Just is the most westerly town in Britain and the closest rest stop to Land's End. Several beautiful coastal walk routes and picturesque beaches make this a favourite town for tourists. Indeed, the blue waters look more Côte d'Azur than British seaside. 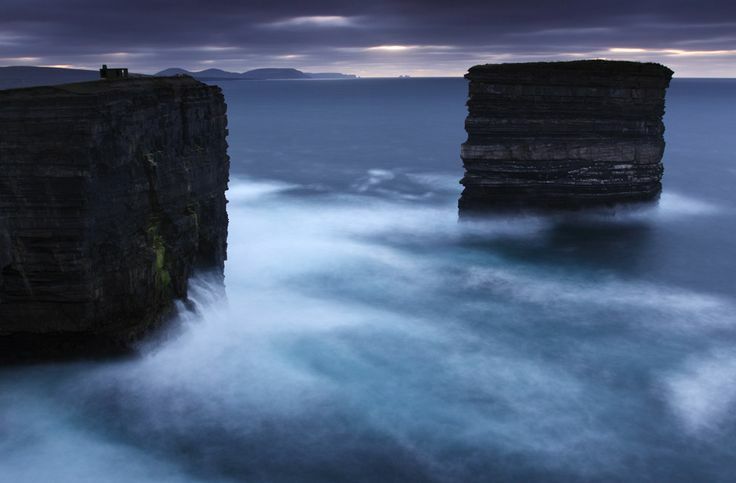 Standing an impressive 126ft out of the Irish sea, Downpatrick Head offers spectacular views of the Atlantic ocean and shorelining cliffs. Cutoff from the mainland, these sea stacks are known as Dun Briste, which translates as 'the broken fort'. They were first separated from the mainland way back in 1393 after high seas. The people living on the cliffs had to be rescued using ships' ropes. Today, the site is particularly popular with birdwatchers who observe the many species of birds adapting to the changes of seasons on the lonely rock heads. Named for the eponymous hero of James Macpherson's epic 18th century poem, Fingal's Cave is a Scottish sea cave renowned for it's strange acoustics. The spooky echoes inspired the Romantic composer Felix Mendelssohn to write an overture named "The Hebrides, Op. 26" in 1829. The arched roof and impressive size of the cave means it operates as a sort of natural cathedral, and its Gaelic name, An Uaimh Bhinn, translates as "the melodious cave." These musical ties continue into the present day, with one of Pink Floyd's early tracks named after the spot. The cave can be reached by visitors thanks to several tour cruises that operate between April and September.